The lovely embossed border takes an ordinary card and makes it exceptional! The personalization is done in raised ink. The price shown is for 25 cards, 25 UNPRINTED UNLINED envelopes. 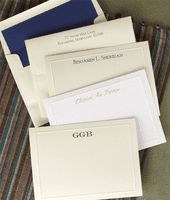 The price INCREASES $18.00 for PRINTED envelopes and an additional $20.00 for LINED envelopes.